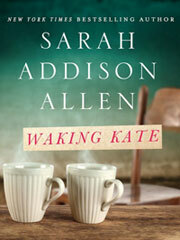 A free short story from Sarah Addison Allen – Waking Kate – that I downloaded to my iPhone has done its job well. Although the story can stand on its own, the promise of how Kate will continue teases the reader to want to continue the tale in Allen’s newest book – On Lost Lake, due to be published mid-January. As Kate is waiting for her husband to come home from working at his bicycle shop, her elderly neighbor invites her to help him mark his retirement from Atlanta’s oldest men’s clothing store. Over a cup of butter coffee, he tells his history, prompting Kate to think about her own life, and foreshadowing major changes soon to come. Who could resist a free story from the author who charmed readers with magic and romance in Garden Spells. Have a cup of coffee and check it out – it’s free. This entry was posted in authors, books, romance, short stories, short story and tagged Garden Spells, magic, On Lost Lake, romance, Sarah Addison Allen, The Peach Keeper, Waking Kate. Bookmark the permalink.